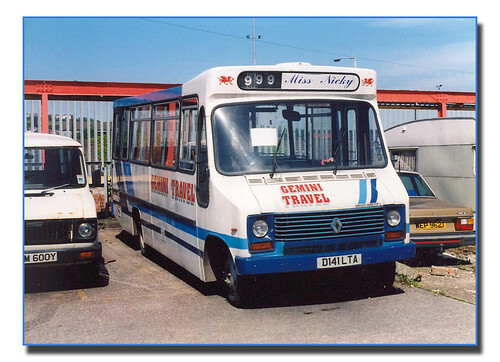 Former Plymouth Renault/Dodge S56 Reeve-Burgess D141 LTA is seen with Gemini Travel, Swansea on the 18th of June 2000. Gemini no longer exists, the owner retired a couple of years ago. © Richard Field - used with permission - Thanks Richard! I bet the drivers at Plymouth Citybus, the ones who drove these in service, really miss these fantastic machines, I don't think so. Its when you look back at what was new 20 years ago that you realise how much better things are now!